Grace Road Group has opened a new type of dessert cafe called, “Patisserie Pacifica” in TappooCity, Lautoka and now in TappooCity, Suva. Those with that sweet tooth who love the taste of anything sweet can now enjoy a variety of pastry at the newly opened outlet. Grace Park, Public Relations Manager, Grace Road Group, said Patisserie Pacifica was created to capture the essence of bringing a wide range of original desserts that could not be found anywhere else in the world, but only in Patisserie Pacifica. “To enhance the taste and also to keep in mind its health benefits, the cakes and breads are made with virgin coconut out instead of butter and margarine. It is one of the innovative treat containing lots of benefits while on the other hand providing a taste of its own kind,” Ms Park said. Pineapple and cassava is also used to create special fillings and desserts that immediately makes it a Fijian attraction on its own for the world. 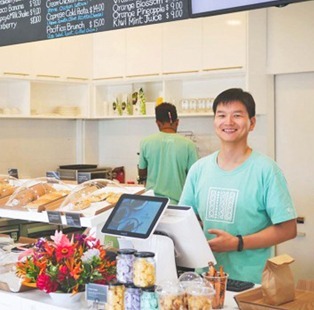 “Patisserie Pacifica has elevated the standard of the food culture by presenting premium pastries such as the macaron, eclair, Mille-feuille, premium danish selections such as apple pie, pine coco, egg tart, and croissant,” Ms Park said. Vegetarians are also treated with bagels made without egg or butter and Korean style red bean bread. The outlet also has meal replacements like juices, smoothie and coffee. Customers can also place special orders in Patisserie Pacifica for healthy cakes. Patisserie Pacifica continues to create innovative, and healthy treats said Ms Park.